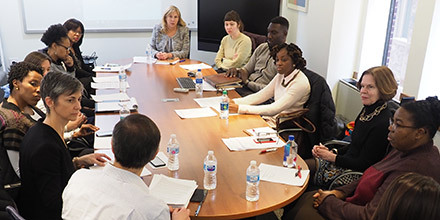 Gathered for their first group meeting are the initial three scholars and some of the faculty mentors of the new University of Pennsylvania Center for Improving Care Delivery for the Aging (CICADA) program. The multidisciplinary research initiative is focused on improving the diversity of the health services research workforce as well as the quality of health care for older adults. Click for larger image. 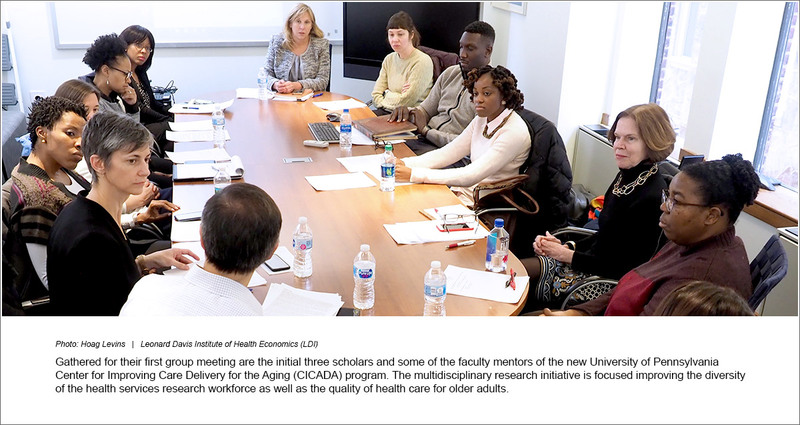 University of Pennsylvania researchers have received a five-year National Institute of Aging (NIA) P30 grant to launch a new Resource Center for Minority Aging Research (RCMAR) that will recruit and develop underrepresented faculty members for the health services research (HSR) field. Called the Center for Improving Care Delivery for the Aging (CICADA), the new Penn initiative will pursue studies of health and health care delivery among older adults. Principal investigators on the new grant are Daniel Polsky, PhD, and Rachel Werner, MD, PhD, who are both Professors in the Division of General Internal Medicine in the Perelman School of Medicine with secondary appointments in Wharton’s Department of Health Care Management. Polsky is Executive Director of the Leonard Davis Institute of Health Economics and Werner is Director of Health Policy and Outcomes Research at the Perelman School. In their proposal that secured the grant, Polsky and Werner wrote "Minority investigators are underrepresented in HSR, with Blacks and Hispanics accounting for only 6.9% and 3.7%, respectively, of the HSR workforce. Yet underrepresented HSR researchers bring essential diverse perspectives and, often, personal experiences to bear in understanding the social, economic, political, and environmental determinants of racial and ethnic disparities in health and health care. Furthermore, according to the federal Office of Minority Health, underrepresentation in research leads to underfunding of health research as well as a lack of culturally appropriate theories, models, and methodologies." CICADA Principal Investigators Daniel Polsky, PhD, and Rachel Werner, MD, PhD, discuss program points at the group's first meeting. Launched in 1997 with centers at a handful of universities, the NIA's national RCMAR program has now expanded to 18 research and training facilities at universities across the country. Each center focuses on a different aspect of aging and health care. Penn's is the only one to focus on the discipline of health services research, the study of how health care delivery is organized, financed, managed, quality-controlled, and regulated. 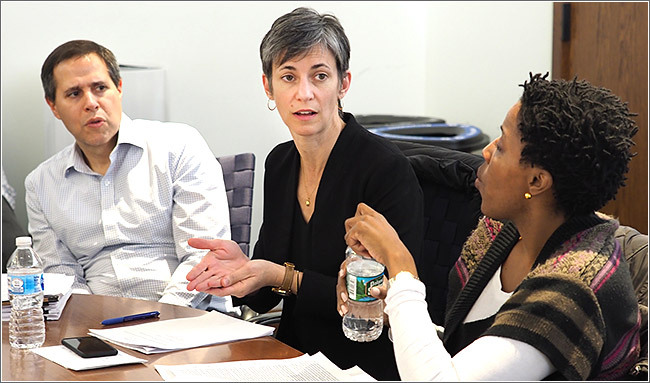 The essential goal of RCMAR is to recruit, mentor, and develop minority junior faculty members into accomplished research scientists, a process that begins with pilot research projects they undertake with their mentors. Since its founding 21 years ago, more than 400 research scholars have come through the RCMAR program, most going on to academic research careers. The CICADA program is facilitated through the Leonard Davis Institute of Health Economics (LDI). Because LDI’s network and infrastructure links all of Penn's 12 schools, CICADA scientists and mentors will be drawn from across the University creating a powerful interdisciplinary approach to training. "The CICADA program is aimed beyond just training HSR scholars," said Polsky. "The goal is to train national and international leaders of a health services research field that will be more inclusive than it has been in the past." "There has been a steady series of initiatives by NIH and its National Institute of Aging in this area," Polsky continued. "The expansion of RCMAR from 5 sites to 18 is happening because NIA has found a model that is very successful. We're really excited to become a part of that with CICADA." "Penn faculty members have been really enthusiastic about participating as mentors in CICADA," said Werner. "I think everyone sees this as a priority both here at Penn as well as nationally." "As the wave of aging boomers continues to crest," Werner continued, "there are more and more older adults in need of high quality health care and they are increasingly stressing a health system that doesn't always deliver care in the best way. So, research focused on trying to improve health care for this poplulation has never been more important than it is now." During its initial round of organizational activities, CICADA selected three scholars for the first year of operation and, just before the winter holidays, convened the first forum of those scholars and the faculty members who will be mentoring them. Kevin Ahmaad Jenkins, PhD, MS, Vice Provost Doctoral Fellow in the School of Policy and Practice at Penn and LDI Associate Fellow. His most recent study investigated how racism-induced stress contributes to an accelerated rate of decline in kidney function. His new CICADA pilot project explores how subjective memory complaints are associated with psychosocial stress and how race and chronic kidney disease alters this association. His mentors are Jason Karlawish, MD, Professor of Medicine at the Perelman School; Kristen Harkins, MPH, Research Coordinator at the Penn Memory Center; Rebecca Hubbard, PhD, Associate Professor of Biostatistics at the Penn Department of Biostatistics, Epidemiology & Informatics; and Judith Long, MD, Professor of Medicine and Chief of the Division of General Internal Medicine at the Perelman School. Adriana Perez, PhD, CRNP, ANP-BC, FAAN, an LDI Senior Fellow is an Assistant Professor of Nursing at the Penn School of Nursing and past Chair and current Policy Advisor of the National Association of Hispanic Nurses Public Policy Committee. Her CICADA pilot project investigates the association between community factors and health outcomes among persons with Alzheimer's Disease and related dementias. Her mentors are Nancy Hodgson, RN, PhD, FAAN, Associate Professor of Behavioral Health Science at Penn's School of Nursing; and Roy Hamilton, MD, MS, Associate Professor of Neurology and Physical Medicine at the Perelman School. Jasmine Travers, PhD, is a Postdoctoral Fellow in the NewCourtland Center for Transitions and Health at the Penn School of Nursing, a National Clinician Scholar at the Yale School of Medicine, a Penn Dean's Distinguished Postdoctoral Fellow for Academic Diversity, and an LDI Associate Fellow. Her pilot project will study the differences in psychosocial, mental health, and medical health outcomes among minority older adults receiving longer-term services and support in community-based settings compared to nursing home settings. Her mentors are Mary Naylor, PhD, RN, FAAN, Professor and Director of the NewCourtland Center for Transitions and Health at Penn Nursing; and Norma Coe, PhD, Associate Professor of Medical Ethics and Health Policy at the Perelman School.